The tricky thing about dampening airport noise is that the noise is a very low frequency with a very long wavelength, around 36 feet, so a simple barricade will do little to stop the drone. But in 2008, airport staff noticed that noise levels were reduced every fall by an unsuspecting phenomenon: plowed fields. After examining the scene, they discovered that the ridges and furrows of the field were spaced in a way that they partially silenced the hum. 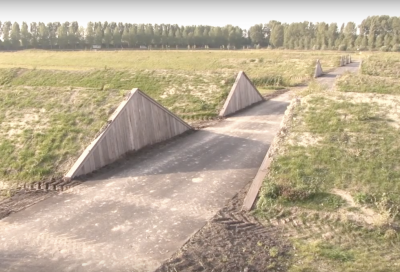 So, the firm H+N+S Landscape Architects teamed up with artist Paul De Kort to produce a series of 150 artificial pyramids of grass, each 6 feet tall and 36 feet apart (the approximate wavelength of airport hubbub). This ingenious method, based on the groundbreaking work of acoustician Ernst Chladni, has effectively reduced noise pollution in the region by half. To the amusement of the people in the area, the 80-acre swath of ridges adds entertainment to utility. Paths for pedestrians and bicycles slice between the grass ridges, and De Kort has even incorporated works of art into the park, including “Listening Ear,” a dish with a gap in the middle that amplifies sound, and “Chladni-Pond,” a diamond-shaped pond where park guests can power a wave mechanism with their feet. A good site for Koninklijke Landmacht forces to ambush enemy armor, too. Looks like the ordnance bunkers at an ASP. Not so good for emergency landings when loss of controls or landing gear and inability to get back to the runway in time means a desperate attempt to glide the belly on softer, flat grassland. But those are so rare these days that noise abatement is probably the better land use. The structures are triangular in cross section but hardly pyramidal. They are more berms or even swales.